I consider table grapes one of the prime ‘climate change ready’ plants, a select group that can be grown successfully over a wide area in multiple climate zones with little fuss for a long time. As conditions change in coming decades, grape vines are a plant that are likely to continue thriving, while more feeble plants falter. In general terms, they adore a sunny position and a climate that isn’t excessively humid (making them a difficult plant for the tropics), but beyond that, they’re not fussy about soil conditions and geographical location. Grape vines grow almost as well in poor, gravelly soil as they do in rich loam, and some growers believe that poorer soils actually produce more intensely flavoured grapes. My advice is to work with your existing site soil, and do not get too hung up about creating super fertile conditions. The plants sink their roots deeply into the earth, enabling the vine to tolerate heat and drought well. Supplemental water during dry conditions will enhance the quality of fruit and should generally be applied at ground level leaving foliage dry to help prevent fungal outbreaks. As for cold, grapes will handle any degree of chilling our Australian climates can throw at them. When selecting varieties, consider how well they’ll suit your existing climate (i.e. some varieties tolerate humid conditions better than others – see Grape Choices, below) and whether you want a single vine or a few. Table grapes are self-pollinating, but to maximise your fruit season it’s worth growing a few varieties that ripen at various stages over summer and autumn. Vines can be grown up posts and over an arbour, or more traditionally, trained on trellis wires stretched between posts. Whatever support system you choose, make sure it’s sturdy. A mature grape vine laden with fruit is heavy. 'Thompson Seedless’: The world’s most popular table grape, widely known by the popular name Sultana. Hailing from Persia (ancient Iran), it produces large bunches of small oval-shaped grapes that turn golden yellow when fully ripe. Deliciously sweet, seedless and ideal for drying. Cane prune for best results. ‘Crimson Seedless’: A late-ripening grape developed in the late 1980s by a pair of plant breeders in California. Abundant producer of light red, oval-shaped grapes that have a crisp texture and sweet flavour. ‘Black Muscat’: A dark red, almost black grape that is very sweet and has a dual purpose as a table grape and for dessert wine. It hails from Bedfordshire, England, where a plant breeder crossed an Italian variety with a Russian variety to produce a large, fleshy fruit that ripens early. ‘Isabella’: An old favourite with gardeners in the extreme climate of western Queensland, ‘Isabella’ is also tolerant of humidity and has good resistance to mildew. A vigorous vine bearing huge crops of round, black grapes that are seedy, but delicious. Ripens mid to late in the season. ‘Autumn Royal’: A relative newcomer released in 1996 that produces spectacular bunches of large, oval-shaped, seedless, blue-purple grapes. Best suited to areas with low humidity. ‘Himrod’: A popular variety in southern Australia that originates from Geneva Research Station in Upstate New York. A cross between ‘Thompson Seedless’ and ‘Ontario’, it has good disease resistance (thanks to labrusca genetics) and produces golden honey-sweet grapes that ripen quickly on the vine. 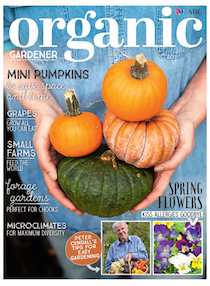 For the full story on growing tables grapes, including growing tips, pruning, pests and disease and DIY sultanas, get the latest issue of ABC Organic Gardener magazine OUT NOW!